Ok, let’s just say that nothing is as discouraging as trying to cut a log down into smaller pieces with a wire saw. Yes, it will work but it takes time and when I say time I mean time. Small branches are fine but larger pieces of wood that you want to add to the fire for a longer burn take forever to cut with a wire saw. The other issue is the fact that the longer it takes you to cut your wood, the longer it will take you to get warm and/or prepare food. But……….who wants to carry a large hand saw around with them in the backcountry? Not me. Besides the weight, which is minimal, the safety issue of a saw hanging off your pack or belt loop is very dangerous. But what choice do you have? I mean, you are limited when you are in the backcountry. Well, there is an alternative and let me tell you about it. 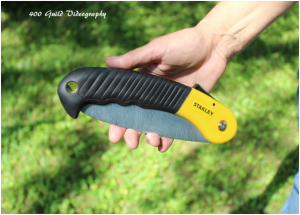 The Stanley Accuscape folding saw is an answer to my prayers when it comes to cutting wood in the backcountry. While it is not your usual camping tool and frankly it is found in the garden section, it works wonders. The size itself may be a bit too big for your pack but it is the perfect size to hang off your belt loop or backpack. The hole in the handle is just the right size for a leather loop or large carbineer but on that note though there is a designer flaw. When the saw is folded back, there is a metal tail that can be seen in the hole. This flaw can cut what you run through the hole, so be careful. Beyond this flaw, this folding saw is made of durable material that will cut many logs along the trail. Also, the locking mechanism is strong enough that it will continue to work and protect for many years. While I do plan to still carry my wire saw, the Stanley Accuscape folding saw is one that I plan to hang off my pack every time I hit the trail. Since this folding saw takes up such little space, it is worth the luxury to carry both the wire and folding saw. But, please always remember to only use downed wood to build your camp fire and before moving on, make sure that your fire is cold.